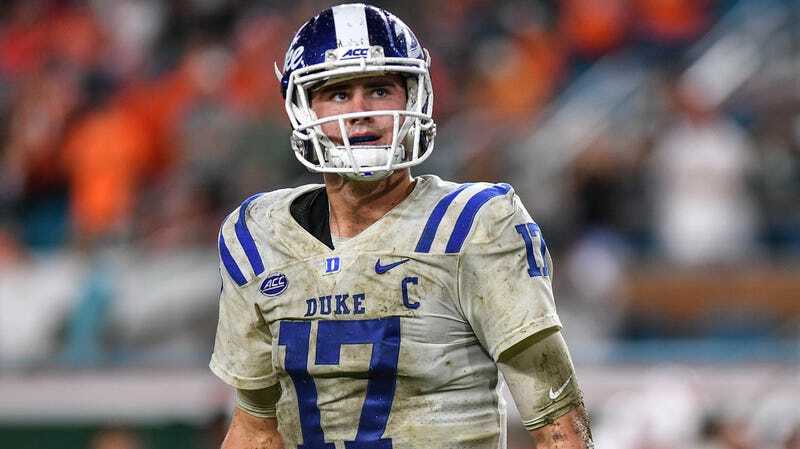 Duke quarterback Daniel Jones lit up the Temple Owls in the Independence Bowl today, throwing for 423 yards and five touchdowns while leading the Blue Devils to a 56-27 victory. Jones, who is exactly the kind of quarterback—a very tall white one—who tends to get football analysts and commentators in a lather, spent the afternoon doing just that. Throughout ESPN’s broadcast, announcers Mike Couzens and Kirk Morrison were utterly enamored of Jones’s height and his ability to exploit Temple’s blown coverages. At one point, Morrison got so excited that he broke out the Peyton Manning comparison. Peyton Manning! One of the best quarterbacks to ever play football! “I’m not trying to, you know, kinda blow this guy up too much, but when you think about Peyton Manning,﻿ and what Peyton Manning was able to do in the NFL, just watch the mannerisms and watch the mechanics of Daniel Jones on the throw,” Morrison said. To be fair to Morrison, Manning’s name wasn’t exactly summoned out of thin air. Duke head coach David Cutcliffe’s helped develop Peyton Manning during his stint as quarterbacks coach at Tennessee, and he recruited Eli Manning to play for Ole Miss when he became that program’s head coach. Still, Jones is a guy who completed 59 percent of his passes while throwing for 2,251 yards, 17 touchdowns, and seven interceptions this year. Duke finished the year 7-5 (sixth in the ACC) and lost their last game to Wake Forest 59-7. Morrison isn’t the only one who is high on Jones, either. Yahoo Sports’ Pete Thamel presents Jones and Dwayne Haskins as contenders for the upcoming draft’s top quarterback. On the one hand, Haskins led an explosive Ohio State offense to a Big 10 title and a Rose Bowl appearance while completing 70 percent of his passes for 4,580 yards and 47 touchdowns. He’s also fourth among FBS quarterbacks in total QBR, per ESPN. On the other, Jones is quite tall. This sort of hype getting attached to a college quarterback who sure looks like a work in progress is what tends to happen when analysts are presented with a particularly shallow class of QBs. This one lost even more depth this week when Oregon quarterback Justin Herbert announced that he will stay in school for another year. All there is to do now is wait and see which struggling NFL team will get caught up in the hype, scoop Jones up with a top-10 pick, and force him into the spotlight.